Lil Chantilly - Lil is Active Duty Navy, womens shooting advocate, NRA Women content partner, long range shooter and gun blogger, at Heelsandhandguns.com. Her name and number is written on a wall between Mississippi and Kentucky in a rest stop bathroom with a secret code, if you dial the number and have the code you could win a date. DOING IT BETTER: Creating the perfect scope testing environment. Aaron - A Law enforcement marketing specialist and the media contact for We Like Shooting and the poster child for obesity, what’s up sir-eats-a-lot? DOING IT BETTER Went shooting with some federal agents and smoked them. Kyle - Host of <redacted at guests request> Podcast, NRA Instructor, and Kung Fu stylist. Little known fact, Kyle was in footloose, but was later replaced by his brother Kevin DOING IT BETTER- Did the WLS shootout challenge and sucked at it. Worked on support hand shooting with my AR. Nick - That's not hot coco you're drinking. Last week we announced our patron project and we’ve seen huge support from you! Thank you so much for believing in what we are doing! To recap, we have a ton of things that we want to do for our audience and we are constantly trying different things to bring those ideas to life. We have launched a campaign to raise money to improve the show and give back to our audience. We are simply asking for you to pledge some money per episode. 50 cents, a dollar, a nickel, a penny (aaron), whatever you can do. It only amounts to a few bucks per month but here’s what you get. What do you get? There are all kinds of rewards and we will constantly be adding to the list. Patches, shirts, swag boxes - SO. MUCH. STUFF. More babies being named after firearms, according to the website babynamewizard.com/blog children being born with gun related names is up more than 500%. Will these kids be banned from schools because of their names? What would you name your child, if you could give it a gun name? I would name my kids HI-point because I expect them to work, but I dont really have that high of an expectation for them. Ever tried to shoot a smiley face into a target Lethal Weapon style? This is where we separate the men from the Aaron’s. Our shootout challenge for March is live. Go to WeLikeShooting.com/shootout, shoot 8 shots from 5 yards, channel your inner Riggs and go all lethal weapon on your target. Shoot a smiley and submit it at WeLikeShooting.com/shootout, we’ll post it on our site and social media and we’ll see who does the best! Andrew Clark - Shawn - Fully tac’d out Daniel Defense AR-15. Really expensive and awesome gun with every attachment you can imagine. Richard Vernon - Savage1r - Taurus Judge. Douche gun for a douche. Brian Johnson - Kyle - M203 Grenade Launcher. Who brings a flare gun?! Carl - Nick - Carl is a janitor, so he gets a GE Minigun so he can "mop things up"
Claire Standish - Lil - Why was Claire in detention? She went shopping. What for? A fully custom 1911 Night Hawk. She was mad at her teacher for putting her in detention, but then she found out that he would take her shooting and she got a little crush on him. Allison Reynolds - Aaron - Any gun she could steal. But probably a mosquito .22 that she took from her moms purse. Because that is all her feminine hands could handle. Found you guys when Lil was on Precision Rifle Podcast. What a great show. ADHD with firearms! Just my speed. Hi-Point.... Now Drink!!! 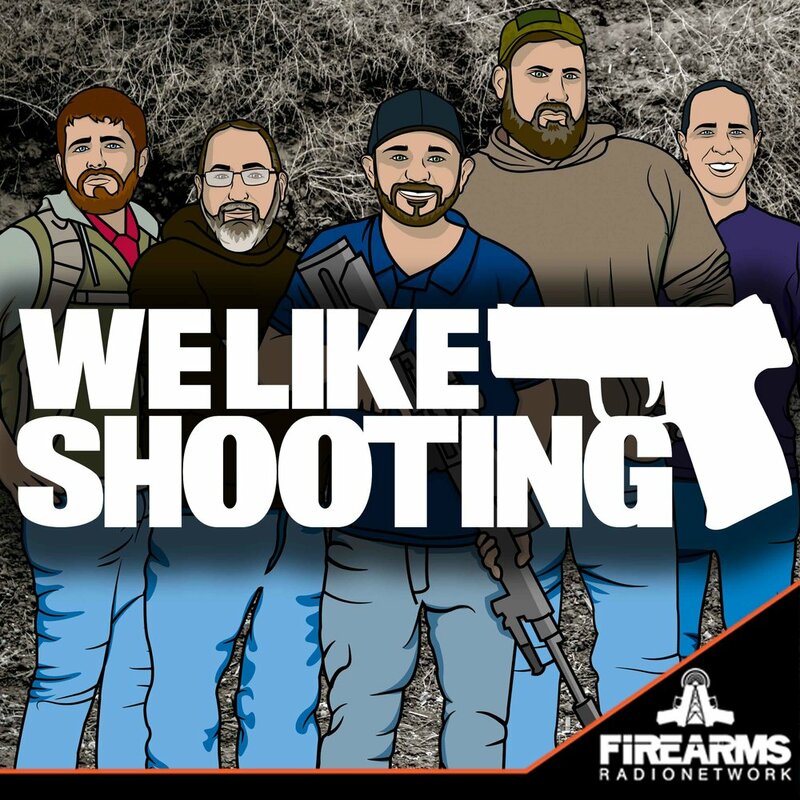 One of my favorite podcasts from the Firearms Network. FUNNY as well as informative. New giveaway! Answer the question of the week. Go to welikeshooting.com/question, every week we’ll randomly select a winner from the responses and give the person that left it a free t-shirt. Questions of the week: What is your favorite AR-15 stock & what is your favorite AR-15 grip, What is your favorite AR-15 muzzle brake, compensator or flash hider? We are giving away an AR-15 from DEZ Tactical Arms, a complete polymer lower from E3 arms, a free Cerakote job for the gun of your choice from Calamity Arms (up to a $250 value! ), Ammunition from AGS Armament, Magazines from Tactical Existence, Gerber knife from Hank Strange, SHM Loudener from Guns of the 111th, T-Shirts, bullet jewelry from Outlaw Glam, paracord bracelets and more. Ktgfirearms.com - 20% off discount for classes for We Like Shooting listeners. Just mention us. Thanks for the heads up from Collin P.
If you could spread the word we need your help fighting the good fight. Here are the bills if you are interested. Changes our constitution from a no registry state to making a registry( like ct ny nj and ca). There are other things added as well but those are the biggest ones. We beat back the gun control activists last year. This year they are coming at us even harder with a ferocity that we haven't seen in the past.